The first event of the HOC’s Athletes’ Commission was held with great success at the HOC premises in order to raise awareness about the concept of dual career of athletes after their retirement. The event took place at the HOC conference hall and was based on experience focused on the protagonists, the athletes and the people who support them. 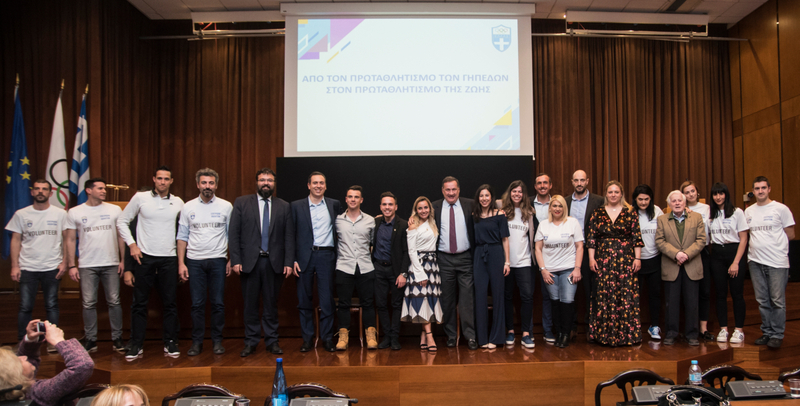 They were divided into pairs, the Deputy Minister of Sports, Giorgos Vasiliadis with the Olympic champion in gymnastics, Lefteris Petrounias, the HOC President, Spyros Capralos with the President of the Athletes' Commission, Vasiliki Millousi, the Olympic champion in sailing, Pavlos Kagialis with the Brand, Marketing Communication and Sponsorship Director of OPAP, Panos Bollas and the world champion in cycling, Christos Volikakis, with the CEO of Stoiximan.gr, Giorgos Daskalakis. The athletes had a sincere and spontaneous conversation and analysed their problems, views and concerns, while they explained what they expect from institutions, companies and people around them who support them. There will be more events to follow about dual career with the participation of experts who will guide and help athletes in the next steps of their new careers.